Joan Crawford (nee Lucille Fay LeSueur) was born March 23, most likely in 1904 (or possibly as early as 1903 or as late as 1908, according to various sources). Lucille arrived in Los Angeles in 1925 after MGM offered her a $75/week contract, and appeared in small silent movie parts, either uncredited, or under her birth name, until her new stage name Joan Crawford was chosen via a Movie Weekly magazine contest in 1925 to "Name the Star". She attended Hollywood parties, dancing and winning contests for the Charleston and the Black Bottom, trying to attract the attention of the movie studios. Joan Crawford appeared in over 30 silent movies from 1925-1932 and was highly visible on the Hollywood scene, especially after meeting fellow silent movie actor Douglas Fairbanks Jr. (son of Douglas Fairbanks and Mary Pickford). Douglas Fairbanks Jr. and Joan Crawford were married in 1929. 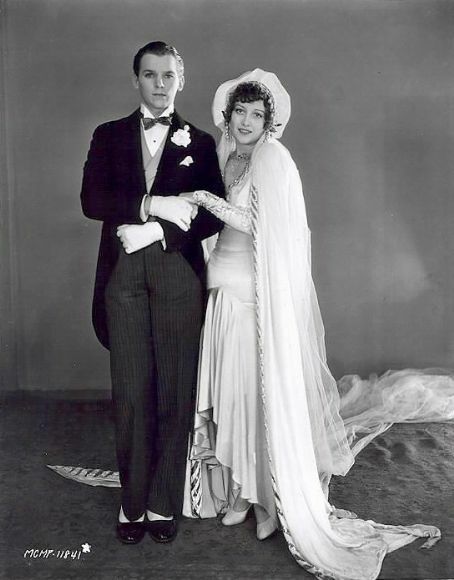 Note the fashions and pose captured in this photograph of the Douglas Fairbanks - Joan Crawford wedding - a great example of a society wedding of the late 1920's early 1930's for Hollywood royalty like Crawford and Fairbanks. "his father called her a cradle snatcher (she was five years older than the groom) and an opportunist who wanted to marry a famous name". 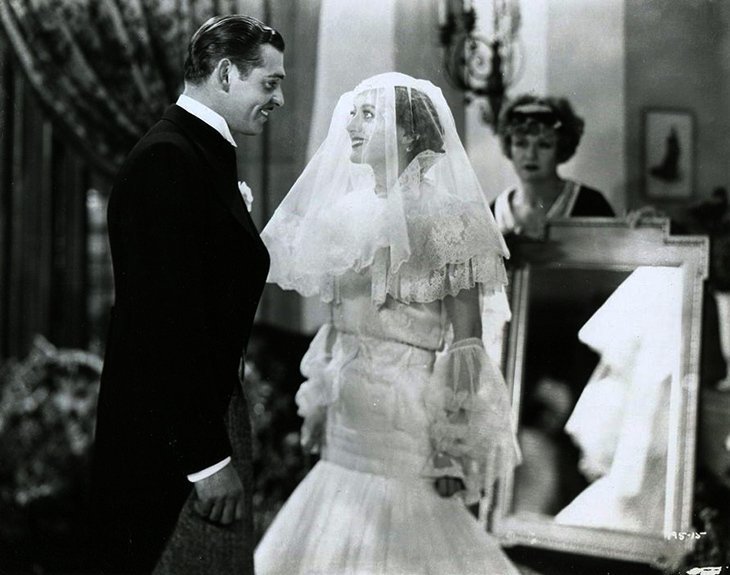 Joan Crawford and Douglas Fairbanks appeared in the movie Our Modern Maidens (1929) and the short film The Stolen Jools (1931). 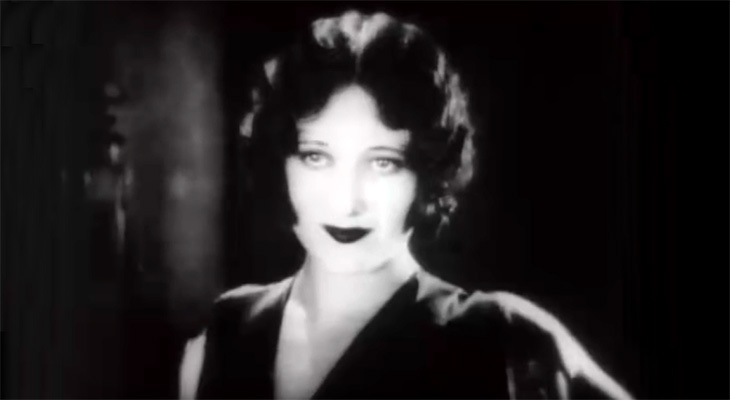 Check out the 1920's flapper hairstyles, fashion, and dialogue in the short clip below from Our Modern Maidens - starring Joan Crawford, Douglas Fairbanks Jr., and the beautiful blonde silent film star Anita Page. Together Joan Crawford and Douglas Fairbanks Jr. attended many Hollywood parties. They both successfully made the transition to "The Talkies", which began in 1928. Below, some clips from the 1931 opening of the Warner Bros. Western Theater (Wiltern Theater) in 1931, with Joan Crawford and Douglas Fairbanks Jr., Clark Gable and his second wife Maria Langham, and other Hollywood luminaries in attendance. Joan Crawford and Douglas Fairbanks Jr. divorced in 1933. According to some reports they split because of Joan Crawford's involvement with her lifelong friend and frequent co-star, Clark Gable (they starred in 8 movies together between 1931-1940); other reports said that Douglas Fairbanks Jr. cheated frequently on her. Among the many movies that Clark Gable and Joan Crawford both appeared in were 2 early films at the beginning on their career, that they were essentially extras in: The Merry Widow (1925) and Ben-Hur: A Tale of the Christ (1925). Of the 8 movies that Crawford and Gable were leading co-stars in, 3 were released in 1931 alone - Dance, Fools, Dance with William Holden; Laughing Sinners with Neil Hamilton and Roscoe Karns; and Possessed with Van Heflin and Raymond Massey. Joan Crawford had top billing in each of these movies. 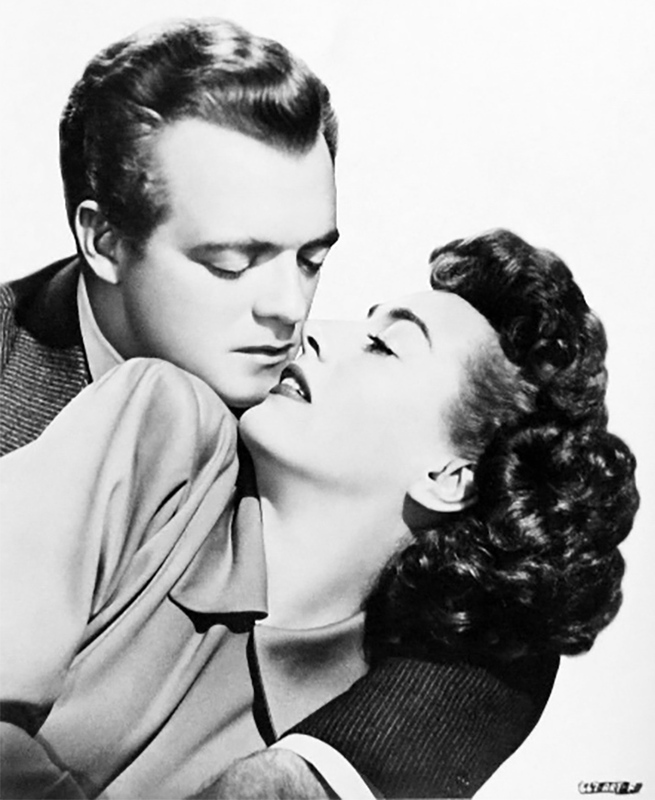 Below, the movie trailer for Possessed features Joan Crawford, Van Heflin, Raymond Massey, and Geraldine Brooks. Joan Crawford's popularity steadily rose during the 1930's. She was placed third on a Top Ten Money Making Stars Poll in 1932 and appeared on it each year until 1936. Below, Crawford played "bad girl" vamp Sadie Thompson, running away from her past in the drama Rain (1932). A missionary zealot (Walter Huston) and his prim wife (Beulah Bondi) take her to task. She received top billing in her first post-divorce film, 1933's Dancing Lady. 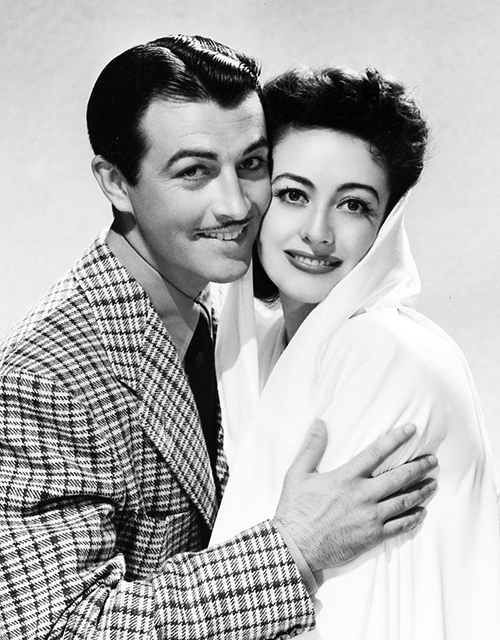 Her co-stars in the movie included Clark Gable, Fred Astaire, and Franchot Tone. Fred Astaire, Franchot Tone, Clark Gable, and Joan Crawford are featured in a movie trailer for Dancing Lady, below. Joan Crawford was paired again with Clark Gable onscreen twice in movies released in 1934 - Chained, and Forsaking All Others. Joan Crawford and Clark Gable's final film as co-stars was Strange Cargo (1940). 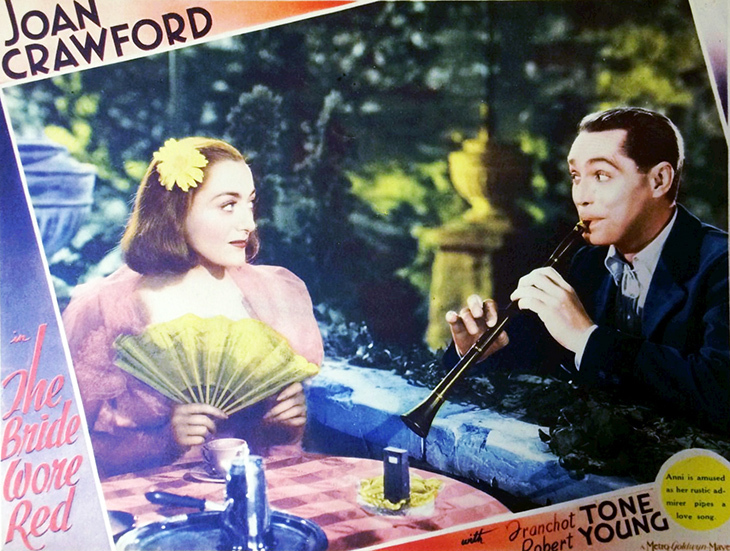 The same year that Dancing Lady was released, Franchot Tone and Joan Crawford also appeared in their second movie together - Today We Live (1933). Their co-stars in Today We Live included Gary Cooper, Robert Young, and Roscoe Karns. The Gorgeous Hussy and Love on the Run, both in 1936. Clark Gable also co-starred in Love on the Run. Franchot Tone's career and aspirations didn't match up to Joan Crawford's, and he wasn't happy playing second fiddle. Alcohol and physical abuse (by Tone) as well as infidelity (by both of them) contributed to their breakup. According to Crawford they remained friends until his death. It was during this time that Joan's long-standing rivalry with actress Bette Davis began; apparently Bette became infatuated with Franchot Tone after he had become engaged to Crawford, and he rejected her (or possibly he didn't reject her, depending on who tells the story). Ironically it was in 1938, one year after Life magazine named her first "Queen of the Movies", that Joan Crawford was among a handful of stars called "Box Office Poison" by theatre owners. The Women (1939) co-starring Norma Shearer & Rosalind Russell, with Paulette Goddard, Joan Fontaine, and Marjorie Main in supporting roles. Susan and God (1940), with Fredric March, Ruth Hussey, Rita Hayworth, John Carroll, and Bruce Cabot. Melvyn Douglas and Joan Crawford were paired onscreen twice, in A Woman's Face (1941), and again in They All Kissed the Bride (1942). Joan Crawford adopted 5 children. Her oldest daughter Christina Crawford was adopted in 1940 while Joan was single, after her marriage to Franchot Tone was finalized in 1939. Joan then married her third husband, actor Phillip Terry, in 1942. They adopted their first son, named Christopher, in 1942; Christopher was reclaimed by his birth mother. Phillip Terry and Joan Crawford then then adopted another son, whom they named Phillip Terry, Jr.
After Joan and Phillip Terry divorced in 1946, Joan's adopted son Phillip Terry Jr. was renamed Christopher Crawford. In the 1942 WWII film Reunion in France, Crawford played a French resistance woman in Paris, who hides an American pilot (John Wayne) from Nazi Germans. Although her performances were still critically acclaimed, Crawford's movies were not making as much money as they had done, and by 1943 her contract with MGM was cancelled after 18 years. The large cast of the WWII musical Hollywood Canteen (1944) had both Joan and her arch-rival Bette Davis in the same picture. Finally in 1945, Joan Crawford received an Academy Award for Best Actress for her performance in Mildred Pierce (1945), as a woman betrayed by her daughter (played by Ann Blythe). 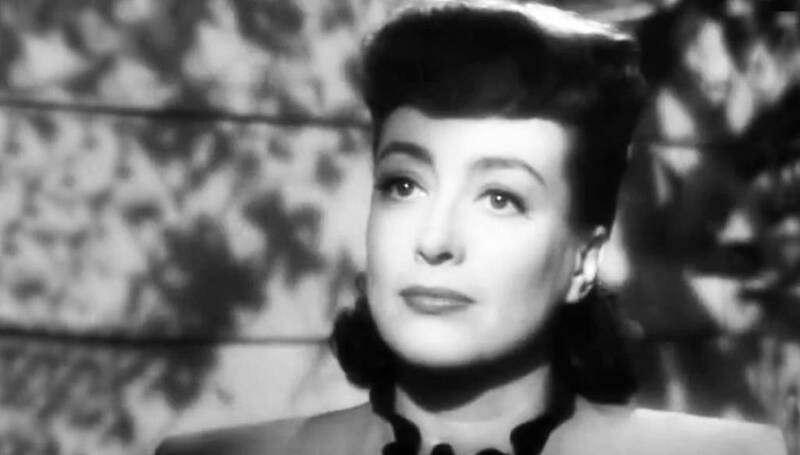 Below, Joan Crawford, Zachary Scott, Jack Carson, Ann Blythe & Bruce Bennett are featured in the Mildred Pierce movie trailer. Her movie career was on the up again, which lasted until the late 1950's. During the 40's and 50's Joan Crawford also worked periodically in radio and on television. In 1947 and single once again, Joan Crawford adopted twin girls - Cindy and Cathy Crawford. Her first adopted child, oldest daughter Christina Crawford, famously later wrote "Mommie Dearest" detailing the unhappy and according to Christina, abusive relationship that Joan had with both Christina and Christopher (both were disinherited by Joan). 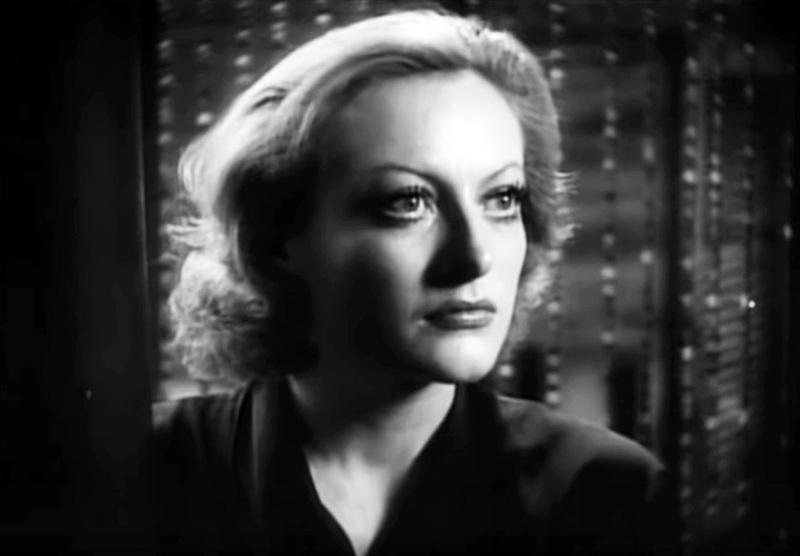 This version of Joan Crawford is disputed by Joan's twin daughters Cindy and Cathy, who were 7 years younger and apparently enjoyed a warm and loving relationship with Crawford. What isn't in dispute, is that by the time Christina Crawford was 9, she and mother Joan often argued; Joan Crawford had an extremely controlling nature and neither Christina nor Christopher had submissive personalities. Joan Crawford was tough woman Vienna in the stylized 1954 western melodrama Johnny Guitar, co-starring Sterling Hayden as Johnny "Guitar" Logan and Mercedes McCambridge as Emma Small. Johnny Guitar's cast included actors Scott Brady, Ward Bond, Ben Cooper, Ernest Borgnine and John Carradine. Below, the movie trailer for Johnny Guitar features Joan Crawford, Scott Brady, Sterling Hayden, Mercedes McCambridge, Ben Cooper, Ernest Borgnine, and Ward Bond. In 1955 Joan Crawford married her 4th husband - Alfred Steele, President of Pepsi Cola. Steele went on to become Chairman of the Board and CEO of Pepsi Cola, and during their marriage Crawford estimated she travelled over 100,000 miles for Pepsi. The Columbia Pictures film The Story of Esther Costello (1957) has Joan Crawford playing wealthy benefactress Margaret Landi, the quasi-adoptive mother to an orphaned blind girl (Heather Sears). 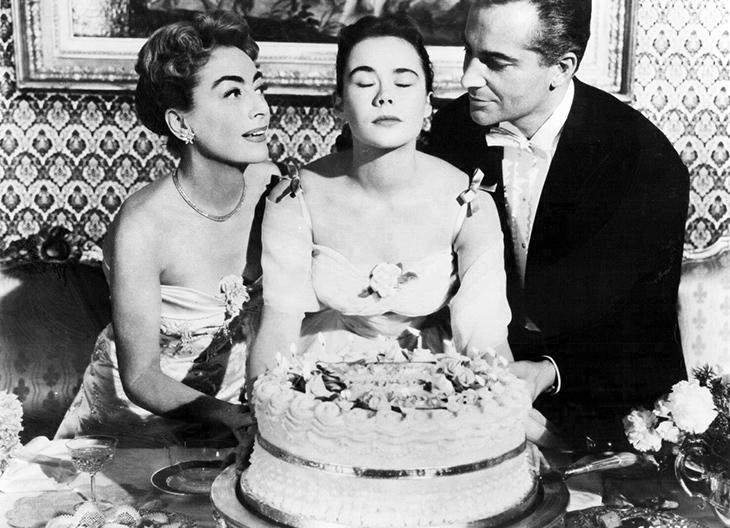 The Story of Esther Costello has actors John Loder, Sidney James, Lee Patterson, with Rossano Brazzi as Margaret's ex-husband, in supporting roles. After her husband Alfred Steele died of a heart attack in 1959, Joan Crawford was left deeply in dept; to help pay off the debt, Crawford served on the Pepsi board of directors and began acting in horror films. By 1962's Whatever Happened to Baby Jane, Joan's film career was winding down. 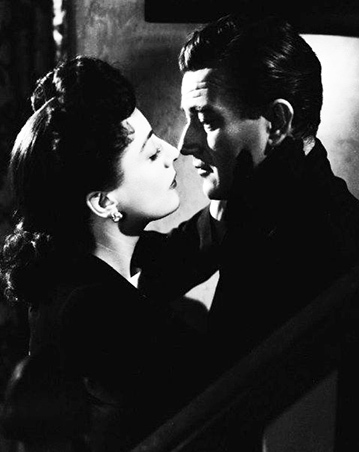 She was cast alongside rival Bette Davis, and although they both survived the movie shoot and publicly said there was no feud, after the movie was over the gloves came off. Below, Joan Crawford in a wheelchair as Blanche Hudson, and Bette Davis as her sister and the title character "Baby Jane" Hudson, are featured in the movie trailer for Whatever Happened to Baby Jane. Bette Davis and Joan Crawford were again cast together in 1964's Hush Hush Sweet Charlotte, and Joan Crawford ended up in hospital part way through shooting Differing reports say it was because of "harassment" by Davis, or alternatively, due to Crawford's alcoholism. "I am so at peace with the world, that I am even having good thoughts about Bette Davis." "As you can imagine, my grandmother didn't like 'grandma' or 'grammy' or even 'grandmother'. She preferred to be called JoJo." Throughout her full-length feature film career which spanned 1925-1970, Joan Crawford appeared or starred in over 30 silent movies and 60 sound films. 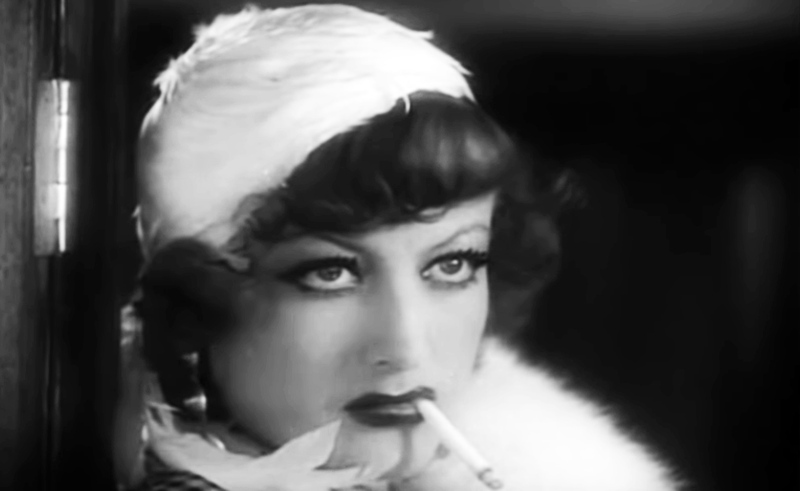 Below, an uncharacteristically almost makeup-less Joan Crawford early in her career, in 1932's Rain. Note: This article was first published in 2015. It has been updated with new / additional content. Memorial Service Music - Old Friends?